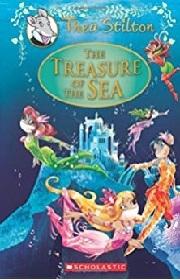 Thea Stilton and the Thea Sisters are needed to help Aquamarina, the magical land of the ocean! The enchanted Music of the Sea has stopped playing and no one knows why. If it doesn't return soon, the realm will perish! The mouselet sand their friend Will Mystery travel to the underwater world to find the magical music. On their mission, they swim through dangerous waters, encounter strange and fantastical creatures and even reveal an ancient mystery. It's a mousetastic aquatic adventure!